Last week, you saw a process get done to the putting greens that was done this time last year. 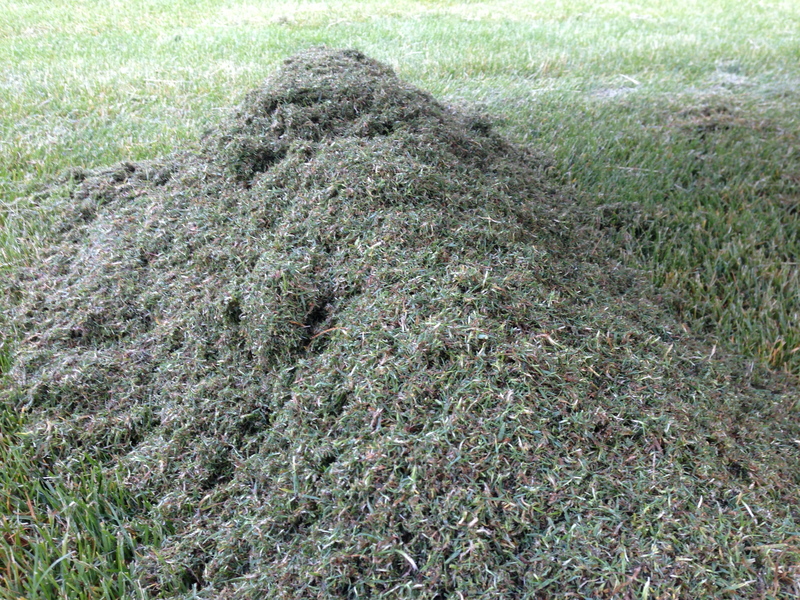 In simple terms, we dethatched the greens. Although the concept is similar to aeration in the spring time, it certainly doesn’t take the place of it. In fact, it removes more surface material than a traditional aerator would. It allows for each putting green to be treated with sand and it gives the sand a little slit to nestle into. The machine is called a Rotadairon. A very detailed explanation can be seen here on their website. The service was provided by Mike Parks from Hillcrest Turf Services (http://www.hillcrestturfservices.net) located right here in Massachusetts. The purpose of running this machine over all 39 greens is to remove the “thatch” layer that builds up over the duration of multiple golf seasons. Although we aerate the greens every year, that machine only pokes holes and removes material 2″ on center (process can be read about here). Sand is then applied to fill the holes in. However, the Rotadairon cuts into the surface approximately 0.5″ – 0.75″ over a 53″ width. 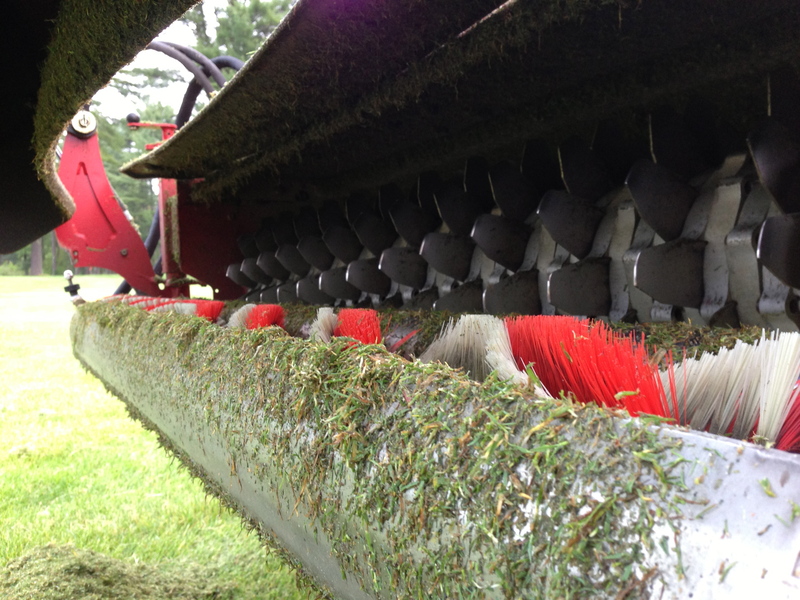 It collects and removes all of the thatch material allowing for immediate air exchange to the roots and improved surface drainage. During the process last week, we mowed the greens, ran the Rotadairon, mowed the greens again to remove the very little debris left behind, blew off the collars, rolled the green, topdressed, fertilized, and watered-in. The topdressing sand is a 1mm sand. This is used because it has a much larger pore space than thatch or traditional soil. The sand will allow for the bent-grass plants to continue to creep and become more dense. This week, we are topdressing again and fertilizing again with a slightly different material. Overall, the achieved result is a firmer, faster, healthier putting green. With the right weather, the greens will be near perfect again by the weekend. Apologies for the short inconvenience. Below, are a few pictures and videos of the machine in action! See you on the course! The attachment is a PTO driven attachment with over 100 blades! An underneath view of the machine. An up close look at the green surface after the Rotadairon has passed. 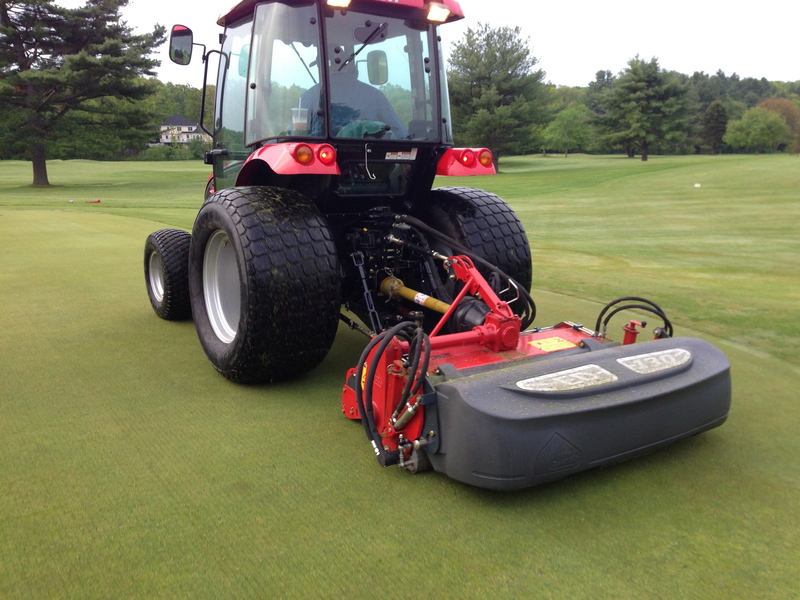 Categories: A Word from the Superintendent..., On the Course | Tags: aeration, golf, greens, may, turf | Permalink. After a long winter, the South course is open for play today. Tees, fairways, and greens are cleaned and playable. Cups have been cut, tee markers placed, trash barrels out, and a surprising opening with carts being able to go on the back 9. Even though there is only one temporary green on 3 and tees pushed forward to a par 3 on 4, nature was pretty good to us. We actually spent a few minutes during lunch today discussing past years that have dealt us torrential rains, heavy snowfall at the end of March, and even the year that had 7″ of snow all winter (leaving us with crazy desiccation on some greens). This year, however, there was a decent melt out during the third week of January. That allowed most of the snow to clear, freeing us from anaerobic concern, but another snow storm shortly followed packing more snow onto the turf. We dealt with a very slow melt over the past month, and although this was good for keeping soil saturation down, it allowed snow/ice to linger on the turf (especially in the shade). Despite the diligent effort of our dedicated staff applying 100s of pounds of sunflower seeds to ice on greens, 3 South green is a temporary green strictly because of turf weakness. It sits in the shade and is surrounded by some massive pines. It has a few pockets on the green, mainly comprised of Poa annua, that collected water this winter, turned to ice, and then suffocated the plant. However, if you get real close, there are many baby Poa annua plants on the rebound. I am confident that within a few weeks, 3 South green will have a healthy, green sheen to it. You may also notice this minor discoloration in a few other greens as the Poa annua is slow to rebound from a long, snow-packed winter. 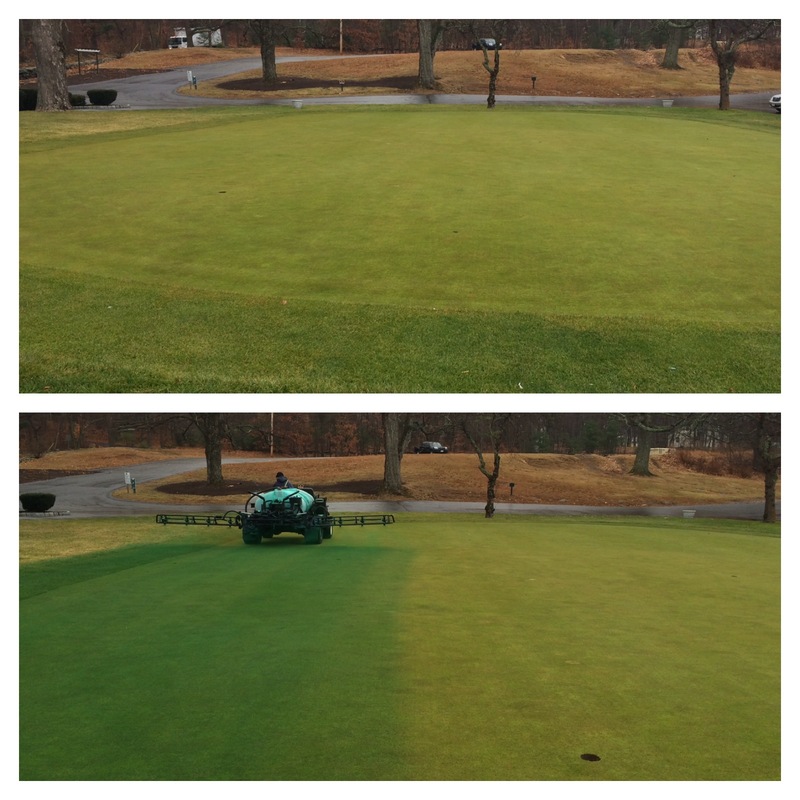 These greens will regain color once the turf breaks dormancy and microbes become more active in the soil. 4 South tee has been moved up to the 200 yard marker and will be playing as a par 3. As usual in the spring, the fairway on 4 is very wet, and we would like you to avoid losing your ball in the middle of the fairway if you played off the normal tee. This fairway is actually level with a peat bog. When the water table is high or the ground is thawing from winter, this fairway is pretty soggy. The North course is melting out nicely and will be ready for play sometime next week. 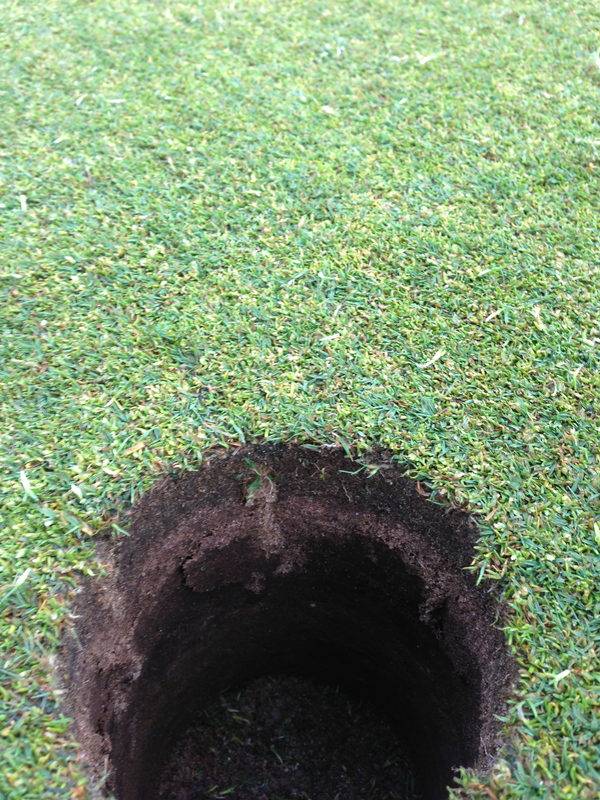 We are happy to report that the turf on the North is a little healthier (not as many pockets on the greens). When it does open, there will not be any temporary greens or tees. All that is left over there is course setup and course cleanup, and there is a lot of it. We will be doing our best over the next week to bring you two clean and playable golf courses. 5 North benefiting from sunflower seeds. One last thing I would like to mention as a hurdle from the long, snow-packed winter is gray snow mold. Some of you may be wondering what gray snow mold is or even why the turf is green in some areas and brown in others as you play on the facility. 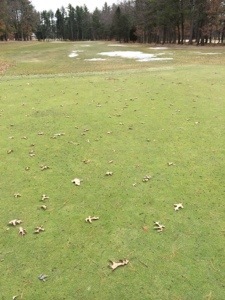 Gray snow mold is a fungal pathogen that lies dormant in the surface layer of the turf until the proper conditions allow for the disease to begin to grow. If snow cover occurs for more than 45 – 60 days and the area is moist, snow mold spores may start to reproduce and form a 3 – 12 inch patch. Mainly a leaf blade disease, the turf will quickly grow out once the temperatures warm up and soil microbial activity becomes active. A spring fertilizer application will also help get the turf growing, and a mower will easily cut off the infected leaf blades. You can also look for this disease in your home lawns as the snow starts to melt. Do not be alarmed. Some of you may notice that some of your turf is actually brown. For most, the turf is lying dormant until the soil temperatures warm up. A late March/early April fertilizer application of a balanced nitrogen, phosphorus, and potassium ratio will give your lawn a nice jump start this spring. Thank you for your continued support, as I enter my 7th season as the golf course superintendent. We are excited to begin another golf season and very eager to get back into the regular routine of golf course maintenance. Play well! See you on the course! Yes, this is my golf course blog. It’s an avenue for me to explain, communicate, brag, and even sometimes vent about what we are doing on the property. I haven’t done that in some time now. I didn’t even put together an “end of the year” recap for 2013. Yes, don’t worry, the golf courses were put to bed just fine and from what I can remember are in good winter shape. I say “from what I can remember” because I haven’t been on the property since December 11th. Very strange for me. I’m usually always at work. Even through the winter. The only thing that comes before work is my family. And, unfortunately right now, my wife is very sick. This sudden illness has left me with “living in the moment”. I am very blessed to have an owner like we do at Stow Acres CC who has allowed me to focus on one thing only right now, my wife. I’ll be back at the course in the future, but right now, I can’t plan for when. I have created a blog about my wife’s illness. I will provide consistent updates of her condition. For these updates, I just ask that you spread this story as far as you can. Doctors are having a difficult time finding a diagnosis for her and comments on this post with every similar story would help. Thanks for your support! Although I posted this last December, it is very applicable to conditions right now. Truthfully, not much changes when winterizing the golf courses. Enjoy. The winter season is upon us, or is it? We can only hope that the snow falling across the blog screen that you are reading right now would be falling on the actual golf course some time soon. Both courses are fully winterized, well, minus the snow accumulation. The irrigation systems have been blown out, drains have been flushed/open, accessories have been removed for refurbishing, snow mold applications have been applied to greens/tees/fairways, Winter Green has been applied to all 39 greens, and two pin positions have been cut on the front 9 of both courses. Yes, two pin positions. I got this brilliant idea from Russ Heller, a fellow Superintendent here in Massachusetts. Russ also has a great blog seen here: William Devine Golf Course at Franklin Park. Well, the theory behind it is to divert foot traffic on frozen/dormant greens surfaces. Closing the greens or providing temporary greens is not something we do at Stow Acres. This is where snow is helpful in covering the greens, but, in order to preserve playing conditions for the Spring season until snow falls, we cut two pins. We will leave pins in both hole locations allowing the golfer to pick whichever hole location they desire. Once on the green, traffic will be split between both hole locations. We’re doing this primarily because we suffered minor turf damage last season from repetitive foot traffic around one hole location pictured below. The turf does heal once the weather gets warmer, but as you can imagine, these spots took quite a bit longer to recover. Our assistant superintendent, Kevin Bracken, had a great idea to place modified greens covers over the trampled spots once we could cut the cup in a new position. This certainly accelerated recovery. Currently, there is no “real” snow in the immediate forecast. However, with the cold temperatures becoming more consistent, we will be covering both practice greens tomorrow to ensure great putting conditions for the Spring. If you plan on playing until it snows, please be mindful of the frozen turf. Greens are most susceptible, so keeping pull carts in the rough and walking on the greens as little as possible will help preserve the surface. I will leave you with a picture of what even foot traffic/pull-cart can do to fairway turf during a frozen morning. Stay warm, play well, and have a great holiday season! Categories: A Word from the Superintendent... | Tags: december, golf, turf, winter | Permalink. More on Frost Delays… Yes, they are necessary. While the temperatures have been generously warm so far this Fall, we are entering a significant drop this week, with maybe even some snow mixed in tomorrow morning. The video below is brought to you by the courtesy of Dr. Larry Stowell from PACE Turf. He helps explain frost delays in simple terms to the everyday golfer. Thanks Dr. Stowell! Enjoy! 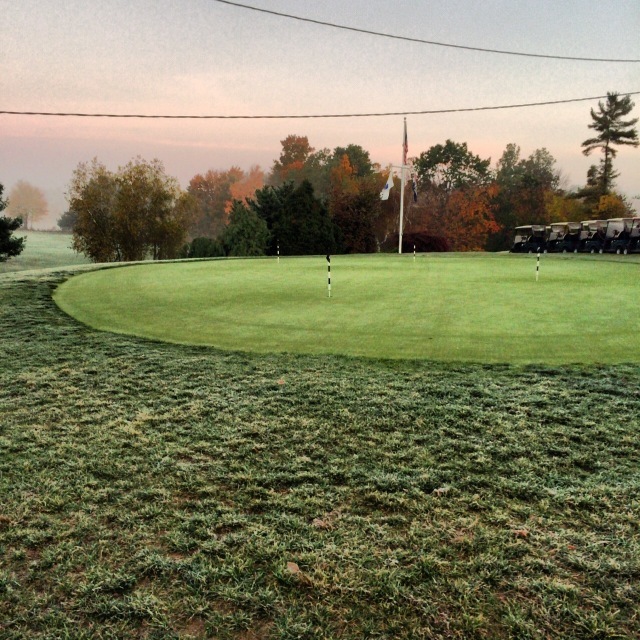 Categories: A Word from the Superintendent... | Tags: frost delay, golf, November, turf | Permalink. I understand that frost delays can be very frustrating, especially if you typically play early in the morning. However, I ask for your patience and cooperation during these delays. It is definitely for the health and playability of the turf. We also ask for your cooperation in obeying the signs on both practice greens. I understand that walking is still allowed on the courses during a frost, but the practice greens typically see almost 50x the amount of traffic than regular greens. Practicing on these greens during a frost delay could result in severe turf injury or even death. We aggressively monitor the conditions and allow carts and traffic to resume on the turf as quickly as possible. Thanks for your understanding! See you on the course! Lower Practice green under a frost delay. Please stay off until the sign is removed. Thank you! Categories: A Word from the Superintendent... | Tags: clubhouse, frost, frost delay, GCSAA, new england, plant tissue, stowacresturf, turf | Permalink. Many of you have been questioning the position of some of the pin placements over the last few weeks. Well, the answer is, we like to make it tough! Just kidding…The real reason that some of the pin placements have been in obscure spots is to give the majority of the green a break from repeated foot traffic. Yes, we have finished aeration, and the greens have returned to normal or better condition, but to keep them that way you will see pins being placed on the outskirts of the greens, or on ridges and hills; areas that you don’t normally see a pin. September and October are perfect months for healing turf, so, why not give some of the usual areas a much-needed break from the long golf season? I apologize for three putts and missed greens. Normal pin positions will return soon! See you on the course! Categories: A Word from the Superintendent..., On the Course | Tags: golf, greens, october, turf | Permalink.